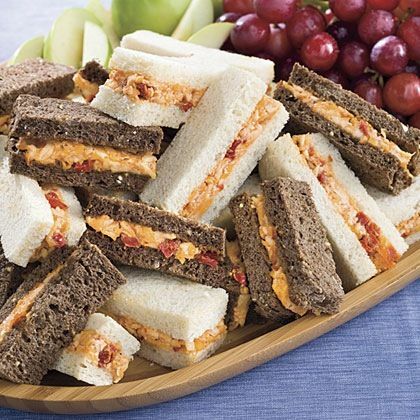 You will find them at just about every Southern gathering and everyone has a different way to make it, but make no mistake, people LOVE pimento cheese sandwiches. There are people like me who prefer it as a dip with Scoops chips, and there are those who are very particular about their ingredients. I interviewed a lady one time who put Ranch dressing mix in her pimento cheese recipe. Jessie Frye said she liked her pimento cheese sandwiches on thick sliced bread and toasted! 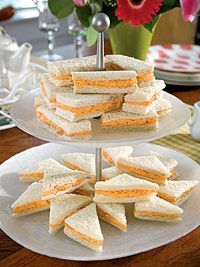 Kate Dickson said, “my mother could really make this, but I don’t have a real recipe.” While Michelle Griffin Cresap said she loves the pimento cheese sandwich at Newk’s restaurants. Kelli Langlois Bozeman said pimento cheese is the best! My favorite pimento cheese tale is about how popular the sandwiches are at the Masters golf tournament, where they still sell them for just $1.50. Wrapped in green sandwich bags, the pimento cheese at the Masters is hard to beat. Some say it is just part of the Masters tradition and it wouldn’t taste right in any other location — there may be some truth to that! The Masters Golf Tournament is not giving away their secret recipe. Fans are just left wondering. 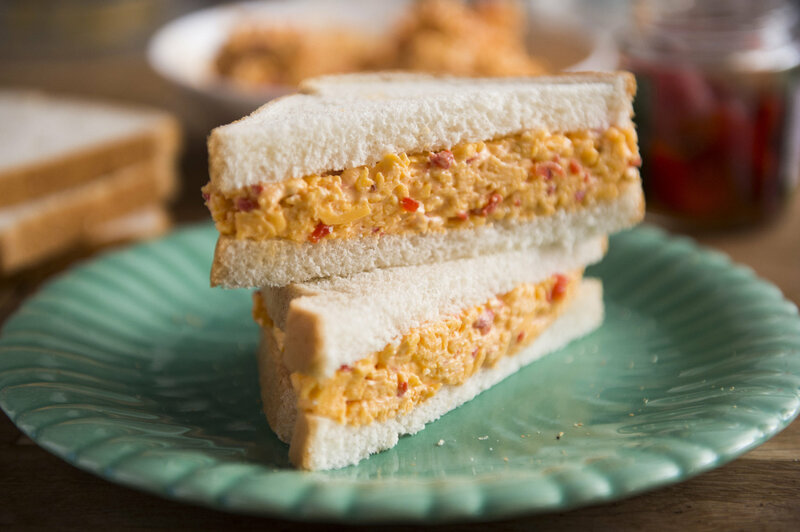 I asked Facebook and Twitter friends to share how they make pimento cheese sandwiches, since everyone has a different take on the recipe, and I was not disappointed. · One of my FAVORITE chefs chimed in with his special take on pimento cheese. Jay Yates of The Veranda said he uses sharp cheddar, cream cheese, pimentos, Hellman’s (mayonnaise), minced jalapeño (optional), little salt and white pepper. Mix until you can’t see cream cheese! · Tammy Carroll said her favorite is 1/2 white cheddar and 1/2 extra sharp cheese, freshly grated. Add a little garlic powder and a smidge of cayenne, pimento, and your favorite mayo. YUMMY! · Christie Bailey Colvin uses four cups of smoked gouda, 1 jar undrained minced pimento, enough mayo (Blue Plate) to make it creamy, dash of hot sauce. Best if mixed and allowed to sit overnight in the fridge. · Shirley Wiltshire finely grates red rind cheese only. She uses chopped pimento and black pepper with Blue Plate or Hellman’s mayonnaise in her recipe. · Beth Sykes Collum uses 2 cups shredded cheddar cheese, 8 oz. cream cheese, ½ cup mayonnaise, ½ teaspoon onion powder, four oz. diced pimentos, drained and ½ dried mustard. With an electric mixer, mix the cheddar cheese and cream cheese together. Mix for 2-3 minutes. Add in the mayo and mix. Add in the garlic powder, paprika, onion powder and dry mustard. Stir everything together. Mix in the pimentos. Refrigerate for at least 10-15 minutes before serving. · Angie Yeager Crenshaw loves smoked Gouda, cayenne pepper, mayonnaise, cream cheese, jalapeños, pimento, salt and pepper in her pimento cheese. · Pat Jefcoat uses shredded sharp cheddar, pimento, mayonnaise, and hot sauce. 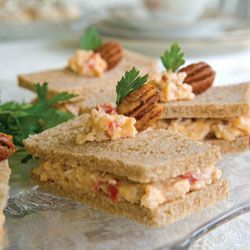 I agree with Connie Medders: “Yummy!” I can’t wait to experiment with some of these variations of pimento cheese this summer. This column was featured in the June 15, 2017 edition of The Winona Times.